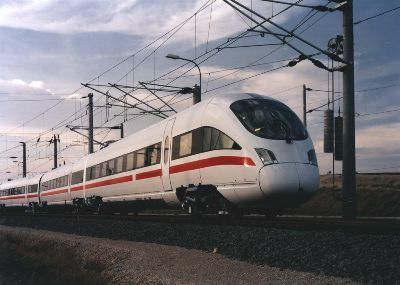 The ICT (officially this stands for "InterCity-Triebwagen") has been derived from the ICE 3, using the tilting technology of the Italian Pendolino. The DBAG had plans to replace all locomotive-hauled InterCity and InterRegio trains by EMUs around 2005. Some of them will be replaced by InterCityExpress trains on high-speed lines, but as it would be too expensive to upgrade all IC lines to high speed lines, a series of IC trains with active tilting system, called ICT, (in the planning phase also called IC/IR-NT) has been built, for higher speeds on the old network. Their styling is similar to the ordered ICE 3, the tilting system from Fiat is the same as in the Italian Pendolino trains ETR 460 and 470, the top speed will be 230 km/h. 43 trainsets have been ordered totally. The initial order contained 11 five car trains, class 415 (5 of them with equipment for Swiss lines), and 32 seven car trains, class 411. Two trainsets can be coupled together (411 + 411, 411 + 415 or 415 + 415), mixed operation together with the ICT-VT will also be possible. Originally, a front gangway to walk from one trainset into another was under discussion, but this option has not yet become reality. Theoretically it will also be possible to couple ICT and ICE 3 together, though this will probably not be done in regular service. The end cars are built by DWA, the middle cars by Duewag, with electric equipment by Siemens and tilting technology by Fiat. Since end of 1997, the first trains (with incomplete interior) were tested in the experimentation centre of Wildenrath, the climate chamber of Wien-Arsenal and the rolling test stand of München-Freimann. The first end cars have been presented on 3rd April 1998 at Bombardier-DWA in Görlitz. One complete trainset was shown at the Innotrans (October 1998) in Berlin. The ICT looks similar to the ICE 3, with a large oval front window. However the front is steeper than that of the ICE 3, the ICT has pantographs on the end cars, and it is only 5 or 7 cars long. A 1 : 1 mock-up model has been built for determining details of the styling. The final design has been changed a bit from this model, for example the top headlight is above the front window now, and a different window wiper was installed. The photo shows the first ICT set at Wildenrath. Some coaches have a "repeater" for use of portable phones. Pantographs (held upright by a special system when the carbody is tilting in curves) and transformers are in the end cars, a high voltage cable supplies the whole train from one pantograph. As Stuttgart - Zürich is one of the planned lines, five trains of class 415 will be delivered with two pantographs of different widths for the German and Swiss network. The middle cars (except for one in class 411) are powered by two motors each, which are mounted under the floor and drive the inner axle of the bogie with a cardan shaft. The traction motors are 3-phase AC motors of 500 kW, same as in the ICE 3. Due to the tilting system of FIAT, there was no room left in the bogies for mounting the traction motors in the classic way. The inverters, which produce 3 phase AC of suitable frequency and voltage for the motors, are in the middle cars next to the transformer cars. The maximum axle load is 15 t.
The active tilting system comes from Fiat and has already been used in the Pendolino trains ETR 460 and 470, used in Italy and Switzerland. The bogies contain all components of the system, which tilts the carbody in curves up to 8 degrees, allowing higher speed and better comfort on curvy lines. The ICT can climb grades of up to 4%. The train has been designed by Alexander Neumeister. By request of the DBAG, it forms a family with the ICE 3, so it is rather similar; the interior is almost the same, with the exception of the arrangements of doors and end rooms. For the 7-car version, this is a ground plan with the seat numbers of the ICT cars class 4110, 4110, 4112, 4118, 4117, 4116 and 4115. This version has no bicycle space. For the 5-car version, this is a ground plan with the seat numbers of the ICT cars class 4150, 4151, 4157, 4156 and 4155 (in "winter" and "summer" version of the bicycle compartment - in the trains of the line Dresden - Frankfurt, the end car looks as shown above for class 411, with no bicycle space at all). The train heads have a rounded silhouette with sharply rounded edge at floor height. Behind a large oval front window is a very spacious cab with central driver console. Separated by a glass wall, a lounge allows passengers to look out of the front window. At first, an arrangement of rounded benches along the sidewalls was planned, meanwhile it has been decided to install regular seats instead, the second row a little higher than the first to provide optimal sight. The window bands and doors are the same as in the ICE 3, the sidewalls are slanted inwards due to the tilt technology. The end cars are 27.45 m long. The pantographs of the ICT will be situated on the end cars, they are moving, steered by a mechanical system, against the tilting movement of the carbodies. In the 2nd class end cars, 15 seats can be removed to make room for 10 bicycles in the summer. The 5-car ICT on the line Stuttgart - Zürich will all provide bicycle transportation. The dining car of the 411 (7 cars) has a kitchen, a 24 seat dining room and a small bar similar to the ICE 3. The 415, designed for less demanded lines, only has a snack bar (BordBistro - some stand-up tables and self service from a bar) and 16 second class seats in the same car. Both trains have a family/baby compartment (3.4 m long, 7 seats) in the same carriage. 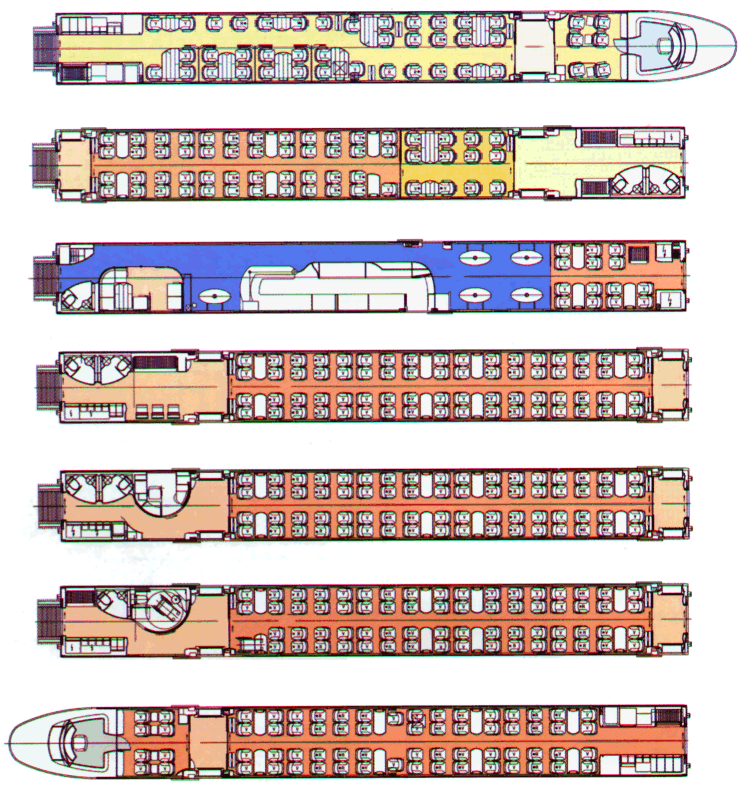 The middle cars are 25.9 m long, the distance between bogie centres is 19 m. On one end, the entrance doors are at the end as in the ICE 3, on the other end, they are shifted towards the centre of the coach, which leaves a lot of space for auxiliary rooms (toilets also for wheelchairs, crew compartment, storage space for bikes and skis) outside of the entrance, but also reduces the seating capacity of the train. 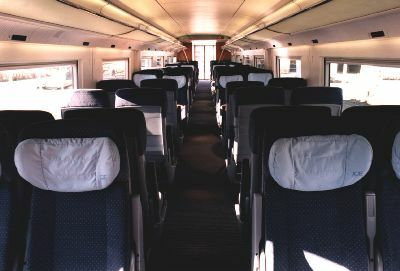 The seating area has a central aisle, distance between rows is 1.02 m in both classes, so the ratio 1st/2nd class can be modified easily by exchanging the seats. 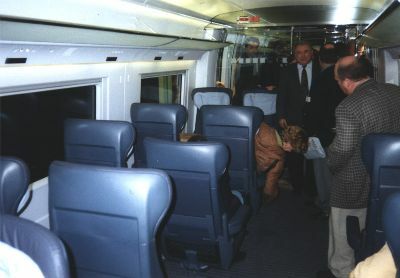 Due to the spacious end rooms, each car has only 16 rows of seats. As usual, the arrangement is 2+1 in 1st class and 2+2 in 2nd class. The 1st class seats will be upholstered with leather - following a recent trend in aeroplanes. About half of the seats are grouped around tables. There will be no more closed compartments, but some 1st class seats are in compartments with half-high walls. The wardrobes known from the ICE 1 and ICE 2 have been given up, so that coats and bulky luggage will have to be stored at the end of the car or behind the seats arranged back to back. The seats are the same type as in the ICE 3, derived from the ICE 2 with some small modifications and a different colour design, a lighter construction than in the ICE 1, leaving more leg room for the passengers in the next row. Each seat has an audio module with on-board and radio programmes as in the ICE, which can be heard with any normal headphone. Seat reservations are displayed electronically, there are also electronic train destination indicators on the inside and outside. One difference to the ICE is that in-seat video will not be provided. In the timetable, the ICT lines show up as ICE, even though some of those lines have a clearly regional character with frequent stops. In May 1999, the first ICT line (Stuttgart - Zürich) opened with 5-car trains of class 415, with additional Integra and ZUB, a narrow pantograph (1450 instead of 1950 mm) on the 1st class cab car, and a bicycle compartment in the 2nd class cab car. On this line, the trains only reach 130 km/h, and they stop in numerous small stations (Böblingen, Horb, Rottweil, Tuttlingen) - however they are still classified as ICE. Currently, some ICT will end in Singen, connecting to a longer but slower locomotive-hauled express train as the capacity of a single 5-car ICT wouldn't be enough for the heavy commuter traffic between Schaffhausen and Zürich. On the Swiss section (partly via Bülach, partly via Winterthur) the ICT can be used without supplement, on the German section moderate ICE surcharges are applied. Together with some Cisalpino trains to Milano (9-car ETR 470), they provide a 2-hour rhythm. These trains change their direction in Singen (Hohentwiel), the 1st class cab car is in front from Singen to Stuttgart and from Singen to Zürich. In May 2000, two new ICT lines were opened. Berlin - Leipzig - Nürnberg - München is operated with one or two coupled 7-car trains class 411, Dresden - Leipzig - Frankfurt (Main) with either a 7-car train class 411 or a 411 coupled with a 5-car train class 415. On some sections, the trains reach up to 200 km/h. With a few exceptions not listed in the timetable, these trains are currently not equipped with bicycle compartments, though there are rumours that they might be rebuilt when Expo 2000 is over. These trains change their direction in Leipzig and Nürnberg, the 1st class cab car is in front from Frankfurt to Leipzig, Dresden to Leipzig, Berlin to Leipzig, Nürnberg to Leipzig and Nürnberg to München. In the first weeks of the new timetable, there were huge delays on these two lines, and a number of technical problems which didn't show up between Stuttgart and Zürich. The trains could not be reversed in 4 minutes in Leipzig, and the tilting system sometimes didn't work, so the trains had to go slower. Also, the air conditioning system in some cars went out of order, doors did not operate and toilets stopped working. As a temporary solution to the timetable chaos, the line Frankfurt - Dresden was shortened to Frankfurt - Leipzig during a few weeks, with additional trains Leipzig - Dresden (partly locomotive hauled, partly class 415). Fortunately, it seems that most of these problems have been solved meanwhile, so that the trains are mostly on time again, with delays of 10 minutes or less. The next planned line is Düsseldorf - Kassel - Erfurt, replacing today's IR trains and speeding up a long neglected east-west mainline through Germany. However some upgrades on this line are needed, so it is not yet known when it will start. In Erfurt, this line will connect to the ICT to Dresden. Fleischmann released a model of class 411 in 1999. The basic set consists of end cars 1st and 2nd class, one of them is powered (in reality these are the non-powered cars). It is available for the DC and FMZ systems. To extend the train, you can buy a 1st class car 411.1, a BordRestaurant car 411.2 and a 2nd class car 411.6. For the full length ICT class 411, two cars are still missing. This model train is tilting in curves, with a mechanical system. Lima has released a model of class 415, without tilting, for both DC and AC. The basic package consists of two cab cars, one of them powered. The three middle cars can be bought separately. Fleischmann released a model of class 411 in 1999. The basic set consists of end cars 1st class 411.0 and 2nd class 411.5 and a powered dining-car 411.2. It is available for FMZ too. To extend the train, you can buy a 1st class car 411.1 and a 2nd class car 411.6. For the full length ICT class 411, two cars are still missing. Arnold had announced a model of the ICT in N scale for 1999. However the project was cancelled, instead they released the ICE 3 in N.
Bombardier/Siemens: Mostly the same trains as already in service. Siemens: Electric version of the ICT-VT with SF 600 bogies. Adtranz/Fiat-SIG: ICN (RABDe 500) as already delivered to SBB CFF FFS. Patentes Talgo: Electric Talgo XXI with two power cars and passive tilting. Delivery is planned for 2004. The tilting system remains mostly the same, but some measures will be taken to increase its reliability. The tables and leather benches in the restaurant car will be replaced by 14 seats of 2nd class and 4 tables for standing passengers (non-smoking; the small bistro area remains a smoking area). This is the implementation of a new service concept mostly based on trolley service of small meals at the seat. Even though it has been decided in 2003 not to abolish the restaurants after all, the new trains won't get a full restaurant - but they get a full kitchen too, so it will be possible to rebuild the bistro car into a restaurant car if neeed. The seating capacity will be increased by leaving out luggage racks and slightly reducing the seat pitch to squeeze one more row of seats into a part of the coaches. The ICT 2 will be the first ICE without the typical "continuous window band". Individual windows are easier to change. A black window band is painted on to achieve a similar appearance. Four windows per car can be used as emergency exits. The seats will not be equipped with audio or video modules, as they have been standard in all previous ICE generations. No more sliding doors in first class half-compartments. Some simplified materials: no more wood panels in the bistro car, a lighter material for washroom floors and bistro tables, metal parts will be powder-coated instead of chromed, fixed wardrobe hooks on the sidewalls. In 2000, the DBAG, SBB CFF FFS and ÖBB formed the TEE Rail Alliance (TEE now stands for "Trans European Excellence"). Together they planned to order 116 electric tilting trains (50 for DBAG, 34 for SBB CFF FFS and 32 for ÖBB) for 230 km/h, of 200 m length, about 400 seats. The 34 trains for the SBB CFF FFS would have been equipped for 3000 V DC to operate into Italy. It was planned to take a decision on 2002-01-31, but then the three railway operators could not agree on one type of train. As a result, the DBAG are buying more ICT, the SBB CFF FFS more ICN and the ÖBB continue to use their old 4010 units and locomotive-hauled trains.